You can listen to 'No hope' here. It's not so long ago I was exposed to The Vaccines for the first time. 'Wrecking bar (Ra ra ra)' was steaming out my speakers. 1.21 minutes of pure energy and over before I knew it, but I definitely liked it. The whole album, 2011 'What did you expect from The Vaccines?' was a different matter though. The album had its moments, but contained more of a promise for the future than it was a great album. So in 2012 comes album number two, Come of age. Does it contain something of this promise? Yes, it does, dear listener, it does. The snotty attitude is still there, while at the same time the songs are of a more consistent quality then on the band's first effort. Most of the album is very entertaining and isn't that what music is about in the first and last place? We are talking The Libertines here, not drunk nor on other substances, so a good bunch of songs in a mix of britpop and rock with a great sixties pop feel and late seventies new wave added. 'All in vain' has this The Who like elements blended in to 2012 attitude, somewhat aloof and very self aware of the possibilities. Singer Justin Young has this combination in his voice, but just as easily does a Ray Davies. 'Aftershave ocean' is as The Kinks as it comes these days. Where new wavers of 1979 would have written about their generation with no hope, these new wavers only talk about themselves. 'No hope' is purely selfish. "There's no hope, and it's time to come of age ... and I know I am so self obsessed .." or .."I don't really care about, anybody else if I haven't got my own life figured out".. and "when you're young and bored and 24..". When Johnny Rotten sang "No future, for me" we knew it was sung for and to all of us. This is such a big difference. Song wise 'No hope' could have been made in 1979, by The Buzzcocks, textually not really. No matter how good this song is -and it is-, it's representative for the more ego driven world of the 21st century. The same where Ray Davies is concerned, compassionate observation is so passez. All in all The Vaccines are not afraid to display its favourite bands of the past decades. As long as the band delivers songs like 'I wish I was a girl', it will always be listened to by me. I just love the lead guitar in this song. 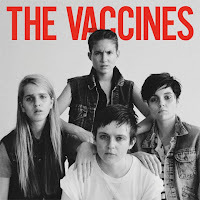 The coming of age has done The Vaccines a whole lot of good and if being totally bored results in songs like the ones on this album, please let the band members be bored forever.